Adrian Winfrid Franklyn was born on the 1st of April 1899 at 26 Heathfield North, where he lived until joining the RAF. He had a sister named Winifred Adrienne Franklyn. His father, an Australian, died when Adrian was 15. On the 20th April 1918 the legendary German airman Manfred von Richthofen was flying over the Somme when he saw six Sopwith Camels below him. With a numerical advantage of over three to one, and conditions in his favour he had no hesitation in making an attack. This attack from above, known as "the Hun in the sun", was difficult to counter and the British formation lost its commander. 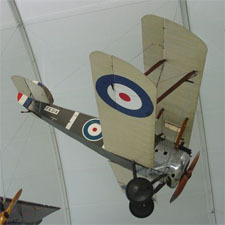 As the German planes went in to further attacks, six more Sopwith Camels arrived on the scene, led by Captain Adrian Franklyn, who attacked Richthofen, driving him down to the cover of the German ground forces. The remaining German aircraft fled. The following day, Richthofen would use the same tactics to avoid attack by the Canadian pilot Arthur Roy Brown, only to die when he was shot down by an Australian gunner. He had made a fatal mistake and had dived on the wrong side of the lines. For this and other acts of conspicuous gallantry, Adrian Franklyn was awarded the Military Cross. The citation in the London Gazette included “On one occasion he silenced an enemy battery which had been most active, and on the following day shot down a hostile plane, which finally crashed to earth. He has on numerous occasions successfully attacked enemy aircraft on the ground and by accurate bombing and machine-gun fire has inflicted heavy casualties on personnel and a very considerable amount of damage to materiel. His skill and gallantry have been of the highest order”.